The higher education system in the Czech Republic begins with a bachelor’s degree. This training program has a training term equal to 3 years. We have developed special training programs to help you to sucessfully pass the enter exam to the universities. You can find out more about them here. After graduation students receive a completed higher education diploma with the award of the title (degree) “Bachelor”. In order to obtain this degree, you must successfully pass all the subjects, pass a state examination (consisting, as a rule, from several profile subjects), as well as write and protect the bachelor thesis. On this you can finish your studies and get a job, or enroll in a Master’s program that will last for 2 years. The bachelor’s degree gives you the right to start a professional career, but graduates of the bachelor’s programs are usually accepted only at the lower and middle level of managerial positions. For further career growth, they will need additional training in the master’s program. The higher education system in the Czech Republic, after completing the bachelor degree, offers education in the master’s program. In this case, a student can change the university, faculty and profession. To continue studying you need to pass several examinations from profiled subjects for a given profession. Students of higher education institutions from other countries are allowed to pass these transitional examinations as well. But it is practically unreal for foreigners to pass these tests. Firstly, there is a lack of proper knowledge of the Czech language and the corresponding professional terminology, and secondly, the examinations are conducted from profile subjects studied in a certain structure in the Bachelor’s program. In addition, all foreign students must nostrificate / recognise a bachelor diploma from their country. For successful entry to the Master’s degree programs we offer you a specialized foundation program. Detailed information on the types and structure of the preparation program can be found here. After successful completion of this stage of study, graduates receive a completed higher education with the award of the title “Master” or in the natural and technical fields – “Engineer”. The term of study in the doctoral program is 2-3 years, with the subsequent completion of state examinations and the defense of the dissertation. After graduation, the student receives an academic title of PhD. 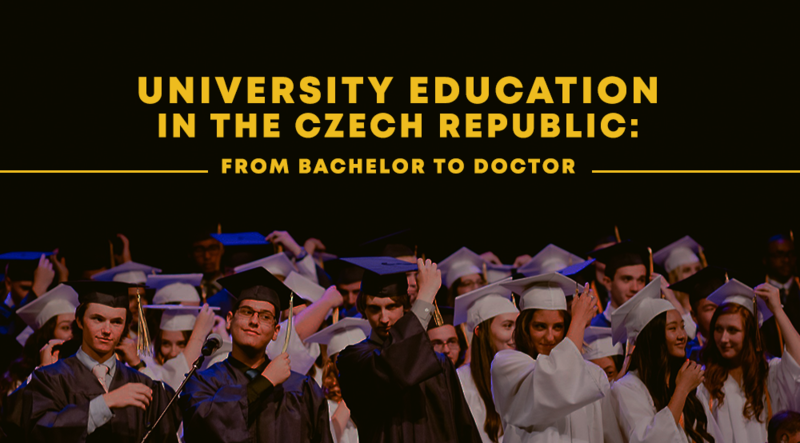 Doctoral studies in the Czech Republic are the highest level of education. Doctoral students have the opportunity to teach at universities, often conduct seminars for junior students. Studying in doctoral programs is free in Czech language. In order to help you to learn Czech, we offer special educational programs.